The jaguar is one of four big cats in the Panthera genus. The other three are the tiger, lion and leopard. Jaguars are the third-largest feline (cat) in the world after lions and tigers, and, on average, the largest and most powerful feline in the Western Hemisphere. They resemble leopards most closely, although they are usually larger and more sturdily built and live in habitats more similar to the tiger. A jaguar’s base coat color can range from a tawny yellow to reddish-brown and black and is typically covered in spots, like a leopard or cheetah. About 6% of jaguars are melanistic, meaning they appear entirely black, even thought their spots are still visible when you examine the coat closely. Like other big cats, very few jaguars are born albino, meaning they appear all white. Compact and well-muscled, jaguars weigh in the range of 124-211 pounds. Large males have been recorded at 350 pounds (the same weight as a female tiger or lion), while some smaller males have been recorded at only 80 pounds. Female jaguars are typically 10-20% smaller than males. Because their limbs are short and stalky, jaguars are great at climbing, crawling and swimming. Jaguars are carnovires – they feed only on meat and prefer large prey like deer and foxes, as well as smaller prey like frogs, mice, birds, fish, monkeys and turtles. They hunt by utilizing the stalk-and-ambush method, stalking their prey before they make a kill. The cat will walk slowly down forest paths, listening for and stalking its prey before rushing or ambushing. Jaguars attack from a hidden place with a quick pounce, surprising their prey. Unlike other wild cats, jaguars very, very rarely attack humans. Over the years, jaguars have developed an exceptionally powerful bite relative to the other big cats, which allows them to pierce the shells of armoured reptiles and employ an unusual killing method: biting directly through the skull of their prey between the ears, delivering an immediate and fatal blow to the brain. In fact, some experts say jaguars have the strongest bite of all the felines, and the second strongest bite of all mammals in the world. Currently, jaguars live in Mexico, Central America and South America (as far south as Paraguay and northern Argentina). Wandering jaguars have occasionally been known to visit the United States but, other than that, the cats haven’t made the U.S. their home since the early 1970s. They prefer to live in dense rainforests, but can also survive in a variety of forested and open terrain. They usually live near bodies of water – like the tiger, jaguars are cats that actually enjoy swimming! Apart from mothers and their cubs, jaguars are solitary creatures who live alone rather than in packs and carve out large territories for themselves, which other cats of the same gender are generally not welcome within. Like other big cats, jaguars can roar – the sound they produce resembles a repetitive cough. Other typical jaguar sounds include mews and grunts. Unfortunately, the world’s jaguar population is declining. The cat is considered Near Threatened by the International Union for Conservation of Nature and Natural Resources, meaning it may be threatened in the near future. 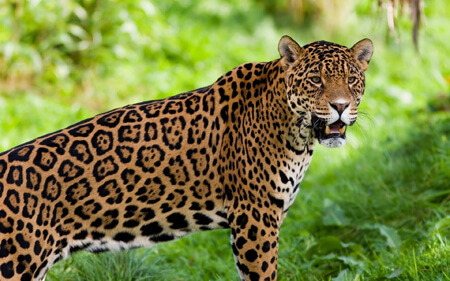 Major risks to the welfare of the jaguar include deforestation, increasing competition for food with human beings, poaching, hurricanes and ranchers who kills the cat when it preys on their livestock.